Tickets include Breakfast, Networking Lunch, Dr. Pepper Snapple Beverages, Snacks... and a whole day of Leadership Learning! Register TODAY! The Symposium Keynote Speaker will be Carter Cast, past CEO at Walmart.com and the founding officer of Blue Nile, Inc. Carter currently is a professor at the Kellogg School of Management and venture partner at Pritzker Group Venture Capital, which invests in early stage technology companies. His discussion will focus on rules and rituals of business life – why some people make it big while others, equally experienced, talented, and credentialed, fall by the wayside – all based on Cast’s personal experiences and deep research into the topic of what high performers do differently than the rest. The Symposium will also feature the CEO of Leadership Story Lab, Esther Choy. Esther will discuss how effective leaders need to leverage the art of storytelling to create extraordinary opportunities. Through the mastery of simple but potent techniques, leaders become more engaging and persuasive. Esther's leadership lessons are extremely valuable to corporate C-Suite and Entrepreneur leaders! Noah Zandan, CEO of Quantified Communications, will share his company's fascinating Top 10 Most Authentic CEO's in America report and their research into what makes an effective leader. He will discuss the most important factors that make your team believe in your vision and business communications. At the end of the Symposium, Drew Clancy, CEO of Publishing Concepts, will conduct a valuable workshop that will walk through some of the leadership actions that has made his company "The Best Place to Work in DFW"! DBC guest have raved about the Symposium as one of the best networking events during the year. We will be providing several innovative networking sessions through the day, including a "Tell your Story" session, "Meet the Authors" break and a highly rated "Meet your Profession" Networking Lunch. Symposium tickets have sold out in the past years. 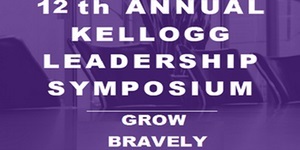 The Symposium is open to all professionals (Not just a Kellogg Alumni event) Want to "jump start" your 2018! Get your tickets soon!